The full community council minutes are always published on Cromarty Live, however we thought it might be useful to give an update from time to time of some of the things we have looked at in the past month that might be of general interest. To meet the requirements of the General Data Protection Regulation (GDPR)) the Cromarty and District Community Council (C&DCC) holds residents’ contact details, with their consent, within password-protected databases. Click on the link to see the full privacy statement. 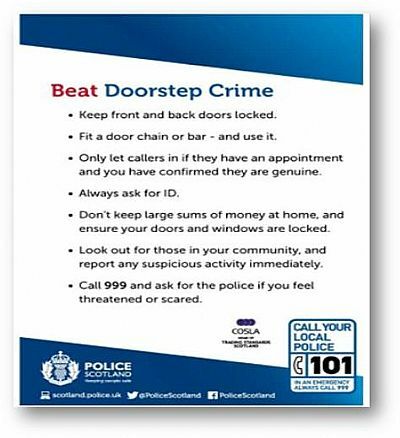 Police Scotland has issued information to help protect people against scammers. The leaflet briefly explains types of scams and how to protect against them. Portfolios assigned to Council members were updated at the August 2018 meeting and can be found here. An update of the activities of the Port of Cromarty Firth can be found here. The 35-page 'Cromarty and District Community Council Objection to proposed Ship to Ship Oil Transfer by the Cromarty Firth Port Authority' document prepared by Cromarty residents Duncan Bowers and Greg Fullarton can be found here in the Document Library. The days are getting longer again and with that brings more activity outside for longer periods. This can lead to an increase in noise calls, socialising outside by way of garden parties etc and as a result, more calls to the police for assistance. The better weather also brings with it the potential for bogus workers to visit homes and try to take advantage of people obviously needing some work done in or around their homes whether that be paving/tarring work or roof cleaning etc. Sometimes, bogus callers try to get into vulnerable adults homes or obtain personal details by pretending they’re someone they are not intending to steal cash or valuables. Rogue traders usually cold call at homes and over charge for unnecessary work, damage property deliberately and use intimidating behaviour to extort money. If in doubt, turn them away politely but firmly, note any details you can (vehicles/names etc) without putting yourself at risk and call the police and/or local Trading Standards. Finally, the recently highlighted issues regarding telephone/online scams has not gone away. Sadly, some people are still falling victim to scam artists on the telephone pretending to be someone they are not, no matter what the situation is you should never pay any money to any cold caller to “release” funds and you should never be persuaded to move funds to a “safe” account because someone is on the phone telling you that your account has been “hacked” or similar. Banks will simply NOT do this to their customers, nor will companies like Microsoft etc. If you are unsure at all, hang up, wait a moment, pick up the phone again, CHECK FOR A DIAL TONE, then call your bank/card issuer or whoever to confirm they want to speak to you. We continue to live in one of the safest most beautiful parts of the world, there is no need to be scared of crime, you just have to remain vigilant and weigh up any questionable situation with great care.